Goodness knows, I try, but the problem is that I and the other people trying to bring more music, different music and new music to people are obscure and have a very limited audience. I did not go to a big school, I have very few connections with famous musicians, I conduct a couple of obscure orchestras (although one of them is really pretty good!) and have no connections in the media world to get people to pay attention to what I am trying to do. Previn, Bernstein and Monrow were well connected, famous musicians with an ability to reach vast numbers of people, and, more important, they were allowed to do what they thought best. When Hindemith died Bernstein devoted an entire Young People's Concert to him the very next month - an hour of Hindemith for 9 year olds - and he was allowed to do it. No 'marketing expert" would permit such an outrage today. These are the people who determine what we hear, and, because they think in such a short term way, they cannot tolerate anything that might take a while to grow. Even I am repeatedly told that on every concert I need to have a "name the public will know"- but there are literally only about 10 names on that list, which means we continually recycle the same repertoire. The irony is that because of my limited reach and outsider status, I still have more freedom than the people who should be the ones bringing new music, new ideas and new people to the music world. Instead, they play the Emperor Concerto again, because...Beethoven. It's depressing. That comment was added by Warren Cohen to my post How classical music squandered its golden opportunity. 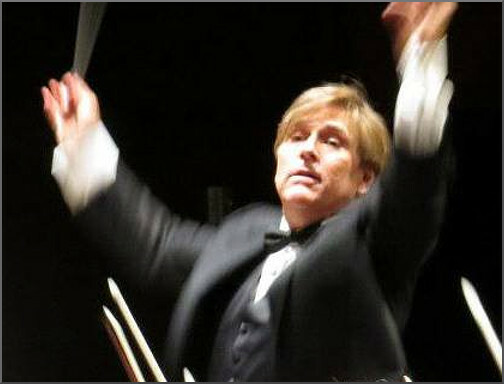 Warren, who is seen above, is music director of the Scottsdale-based MusicaNova Orchestra and artistic director of the New Jersey Integration Orchestra. Reader's comments are always valued, but when they come from those holding the baton such as Warren and John McLaughlin Williams they are doubly valued. These contributions from the Young Turks of the conducting profession give me faith that all is not lost; although all certainly does seem lost at celebrity level - the very people who, as Warren Cohen points out, should be bringing new music, new ideas and new people to the music world. And no comments please that Hindmith does not put bums on seats. If you want bums on seats programme Ravel's Bolero with a pole dancer. Creating the link to the YouTube video of Warren Cohen conducting the MusicaNova Orchestra in Borodin's Second Symphony prompted me to listen again to Loris Tjeknavorian's 1977 recording of the three Borodin symphonies with the National Philharmonic Orchestra for RCA. Produced by Charles Gerhardt and engineered by Kenneth Wilkinson this is one of the great documents of the gramophone. Copies are still around of the CD transfer; if you have not heard it you are missing something very special.